My favourite activity is the See-Think-Wonder thinking routine from the Visible Thinking Programme (Harvard University-Project Zero). It works well with all ages and nearly all levels. When: I use it when I want to stimulate students’ curiosity, encourage them to think carefully about why something looks the way it is, make predictions, careful observations, and thoughtful interpretations. What do you think about it? / What are your thoughts? Students can work individually, in pairs or in groups depending on the multitude of ideas you want to generate. They can first write their responses on paper before sharing them with the rest of the class or just try the routine in their heads. 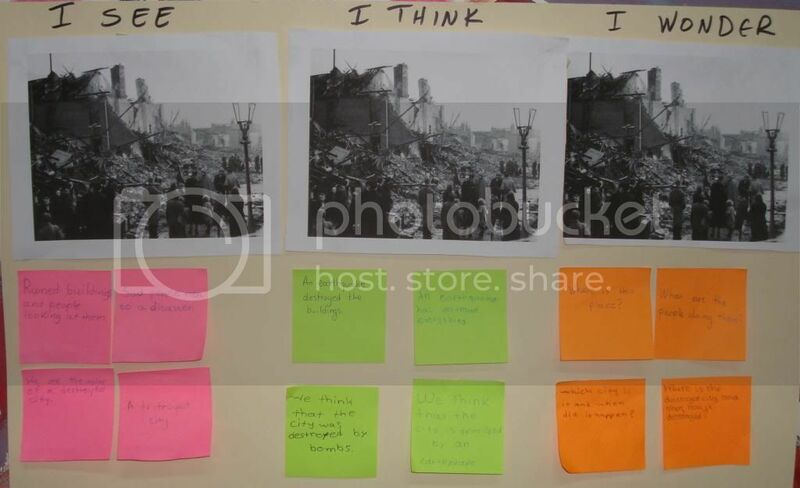 How to make students’ thinking visible: keep a visible record of their responses to the three stems. Construction papers on the walls where students’ responses are written down, post-it notes, slips of paper, or any other sort of visible documentation you can think of, so that a class chart of observations, interpretations and wonderings are listed for all to see and maybe return to during the course of study. Tips: The routine works best when students answer by using all three stems at the same time, “I see…, I think…, I wonder…” It’s OK if students begin by using one stem at a time, i.e. “I see…” You just need to scaffold each response with a follow up question for the next stem. Once students get familiar with the routine they will be using all three stems together. I hope you find it worth experimenting. Thank you! I have also been fascinated by the great potentials of using the Visible Thinking Programme Routines in the efl context.